Alden Caleb Ehrenreich (US pronunciation: /ˈɛrənraɪk/; born November 22, 1989) is an American actor. He made his feature film debut in Francis Ford Coppola's independent film Tetro (2009) and appeared in Coppola's subsequent film Twixt (2011). In 2013, he appeared in Woody Allen's Blue Jasmine, Park Chan-wook's Stoker and starred in Richard LaGravenese's Beautiful Creatures. In 2016, he starred as Hobie Doyle in the Coen brothers comedy Hail, Caesar! and as Frank Forbes in Warren Beatty's Rules Don't Apply. In 2018, he will star as Han Solo in an as of yet untitled Star Wars spin-off film revolving around the character's younger years. Ehrenreich was born in Los Angeles, California, the only child of Sari (née Newmann), an interior designer, and Mark Ehrenreich, an accountant. He is named after the director Phil Alden Robinson. His stepfather, Harry Aronowitz, is an orthodontist. Alden is from a Jewish family (from Austria, Hungary, Russia, and Poland), and was raised in Reconstructionist Judaism. Ehrenreich began acting at the Palisades Elementary School in Pacific Palisades, Los Angeles, and continued doing so at Crossroads School in Santa Monica, California. After graduating from high school, he studied acting at New York University, but never finished his degree. In 2009, he co-founded "The Collectin" with his friend Zoë Worth in New York that consists of actors, writers, producers and directors who collaborate on films and theater performances. Ehrenreich was discovered at a friend's bat mitzvah reception by Steven Spielberg, when Spielberg watched a comedy video created by Ehrenreich and a friend, "which began in the present and eventually cut to 20 or 30 years later, with Mr. Ehrenreich, in a kimono, screaming to stop a wedding." Ehrenreich has described the comedic performance he gave in the movie as: "I ran around as a skinny little punk, trying on girls' clothes and eating dirt." He was then contacted by DreamWorks, a studio which Spielberg helped found, and met with its casting director. The meeting with Spielberg led to acting roles on television shows such as Supernatural and CSI: Crime Scene Investigation. In 2013, he starred as Ethan Wate in the film adaptation of the novel Beautiful Creatures, and appeared as Whip Taylor in Park Chan-wook's thriller film Stoker. He then played the stepson of Cate Blanchett in the Woody Allen-directed drama film Blue Jasmine. In 2016, Ehrenreich became more widely known for his co-leading role as Hobie Doyle in the Coen brothers film Hail, Caesar!, alongside a cast that included Josh Brolin and George Clooney. Many critics praised Ehrenreich's performance in particular. Ehrenreich starred in the leading role of Frank Forbes in Warren Beatty's romantic comedy-drama Rules Don't Apply, released on November 23, 2016. He will star in The Yellow Birds (2017) with Tye Sheridan, Jack Huston, and Jennifer Aniston. In March 2016, The Hollywood Reporter reported that Ehrenreich was one of a number of actors to audition for the role of Han Solo for the upcoming Star Wars anthology film, and had made the final shortlist. On April 16, 2016, Deadline.com reported that he was the frontrunner for the role following a series of secret screen tests. On May 5, 2016, Ehrenreich was cast as Han Solo, with the film following Solo's early life before the events of the original 1977 Star Wars. 2005 Supernatural Ben Collins Episode: "Wendigo"
2006 CSI: Crime Scene Investigation Sven Episode: "Built to Kill, Part 2"
1 2 "Alden Caleb Ehrenreich". FamilySearch. Retrieved November 9, 2015. 1 2 3 Martin, Michael (May 1, 2010). 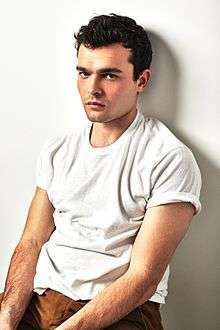 "Alden Ehrenreich". Interview. Retrieved May 27, 2010. ↑ Motika, Libby (May 9, 2016). "Ehrenreich Earns Raves for Acting". Palisades News. Retrieved September 18, 2016. ↑ Keeps, David A. (December 1, 2005). "Tradition, but with a twist". Hartford Courant. Retrieved May 27, 2010. ↑ "Kvell Corner". Kehillat Israel Reconstructionist Congregation. Archived from the original on July 26, 2011. Retrieved May 27, 2010. ↑ "Alden Ehrenreich". EthniCelebs. Retrieved February 9, 2016. ↑ Ayers, Mike (February 5, 2016). "Alden Ehrenreich's Road to the Coen Brothers and 'Hail, Caesar!'". The Wall Street Journal. Retrieved February 5, 2016. ↑ "Collectin Consciousness". Interview. July 12, 2010. ↑ Sancton, Julian (April 7, 2010). "Alden Ehrenreich's Magic Show". Vanity Fair. ↑ Hill, Logan. "Francis Ford Coppola's New Star Alden Ehrenreich on Not 'Trickling Up' Vulture". Paste. Retrieved July 26, 2012. ↑ Hill, Logan (March 30, 2009). "Blessed". New York Magazine. ↑ Corliss, Richard (June 11, 2009). "Coppola's Tetro: An Offer You Can Refuse". Time. Retrieved June 23, 2009. ↑ Ebert, Roger (June 17, 2009). "Tetro Movie Review". Chicago Sun-Times. Archived from the original on June 6, 2011. Retrieved June 23, 2009. ↑ Han, Angie (February 22, 2011). "Watch the Sofia Coppola-directed Miss Dior Cherie TV Commercial Starring Natalie Portman". /Film. Retrieved November 21, 2015. ↑ Kroll, Justin (September 2, 2014). "Alden Ehrenreich Joins Cast of Coen Brothers' 'Hail Caesar!' (EXCLUSIVE)". Variety. ↑ "'Hail, Caesar! ': Hooray For the Coen brothets' Hollywood Homage". Chicago Sun-Times. Retrieved February 5, 2016. ↑ Busch, Anita (February 24, 2014). "Warren Beatty's Untitled Howard Hughes Pic Finally Takes Flight Financed By Billionaire Boys' Club; Ehrenreich, Collins To Star In Love Story". Deadline.com. ↑ Busch, Anita (October 6, 2015). "Jack Huston & Jennifer Aniston Join War Pic 'The Yellow Birds'". Deadline.com. ↑ Kit, Borys (March 15, 2016). "Disney's Young Han Solo Search Narrows to Final Shortlist of Actors After Screen-Tests (Exclusive)". The Hollywood Reporter. ↑ Busch, Anita (April 13, 2016). "Alden Ehrenreich Emerges As Front-Runner For Han Solo Film". Deadline.com. ↑ Busch, Anita (May 5, 2016). "Alden Ehrenreich Lands The Lead In 'Star Wars' Han Solo Film". Deadline.com. Retrieved May 5, 2016. ↑ Utichi, Joe (July 17, 2016). "Alden Ehrenreich Introduced As Han Solo Stand-Alone Pic & 'Episode VIII' Teased At Star Wars Celebration". Deadline.com. Retrieved July 17, 2016. ↑ Wood, Jennifer M (May 6, 2016). "Meet Han Solo: 12 Fast Facts About Alden Ehrenreich". Mental Floss. Retrieved May 15, 2016.